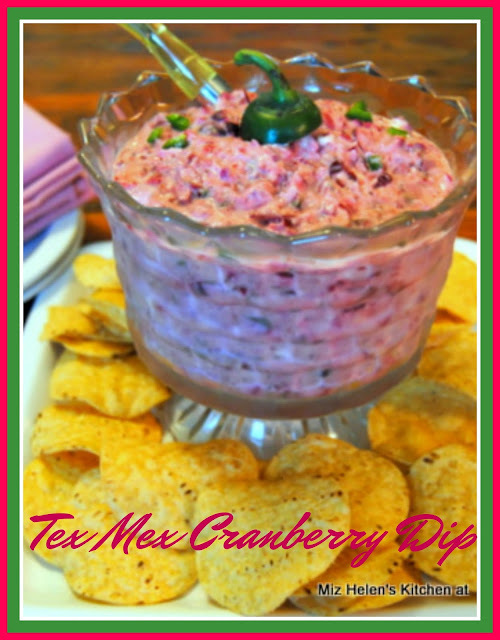 Tex Mex Cranberry Dip and the holidays go hand in hand here at the cottage. We start making this dip around thanksgiving time and serve it through Christmas and New Years, it seems to be one of our favorites. This dip is a blend of fresh cranberries and fresh jalapenos blended with special spices and cheese. It is great served with chips or crackers. We have used it as a spread for little sandwiches, it is just a very versatile recipe to have during the holidays. Place the cranberries, lemon juice, jalapeno's, cumin, chili powder, salt and cayenne pepper into the food processor. Pulse the food processor until the cranberries and jalapeno's are chopped very small. In a medium mixing bowl, using a hand mixer, mix the cream cheese and whole cranberry sauce until smooth. Add the cranberry mixture from the food processor and mix well. Try not to over mix, but just to mix until well blended. Place in a serving dish and chill for at least 2 hours before serving. Thanks so much for stopping by today and spending some time in the kitchen with us. It is always more fun to cook with a friend. Hope you are having and enjoying great parties during the holiday season and come back to see us real soon! This dip sounds soooo tasty, Miz Helen! Oh this looks delicious. We seem to be all about cranberries lately!